This cotter is wound or turned on from the middle out. Start by threading the open wire end inside the circle into the hole on shaft or pin. Keep turning the ring until it snaps into place. To remove, start turning the circle again in the same direction and it comes right off. Very secure fasteners, circle cotters are used where sharp ends are not allowed. Smooth all around, this fastener is ideal for applications associated with fabric. Other cotters available from Pivot Point include Bow-Tie Locking Cotters, Rue-Ring Locking Cotters and Hair Pin Cotters. 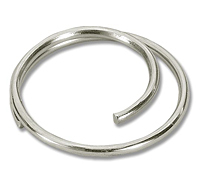 Other ring-style fasteners include Split Key Rings and Basic Rings. Circle Cotters are made from hard drawn MB spring wire, zinc plated or Stainless Steel (300 Series). Circle Cotters are great for fabric/canvas applications. Stocked in Stainless!